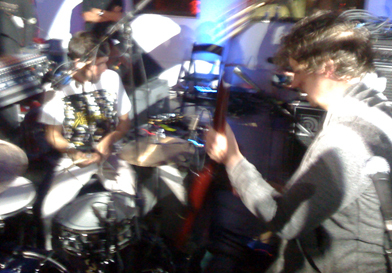 Here’s a couple pics from the party Saturday night. 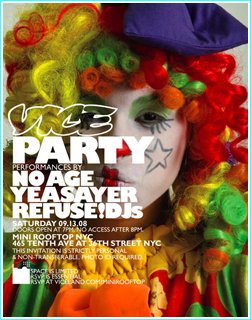 This weekend vice is throwing a party for their Clowny Clown Clown issue at Mini Cooper branded experiential marketing stunt / performance space The Mini Rooftop in NYC *cough*blog*cough* w/ current indie darlings No Age (yes that good), Yeasayer (withholding judgment) and REFUSE! DJs. Seeing how Vice Magazine in general (and one lady friend in particular) does not have the best track record when it comes to rooftops and / or balconies, we thought we’d take the time to alert the public that guest list is CLOSED.